Often during the summer, it’s easy to find yourself plopped right in front of your computer screen, completely chained to it without even thinking of getting off your bum and moving! We all know it’s essential to eat some fresh, nutritious meals, work out effectively, and think positively! There are endless articles, books, magazines, websites, pamphlets, and videos that are out on the Internet or in-store that offer ways to make you skinnier. This is the season of absolute spontaneity, enjoyment, and even carelessness. But don’t get too careless. I’ve begun to slack off on my exercising, but luckily, it’s never too late to change and fix things before they get worse. As you regain your motivation that you lost for a couple days (maybe longer), refocus on what’s important to you and what your goal is this year. If you’d like to lose a few pounds, strive for it and keep going. If you’d like to make a big change, then do it! Don’t just keep putting it off, like we all know we do. Diets seem to always start the “next day,” and the next day could be weeks or months away. I confess that I have Googled [fast] ways to get slim and some of you maybe can relate. I found one great answer and it was a Yahoo question. Perhaps you’ve seen it already, too. If you want to get rid of your seemingly “enormous” belly fat that just seems to be sitting there, all up in your stomach, ruining your self-esteem, then I suggest you do the 8-minute abs workout. It’s a YouTube video that is so 80’s and geeky, but it has over 10 million views and I found it convincing. 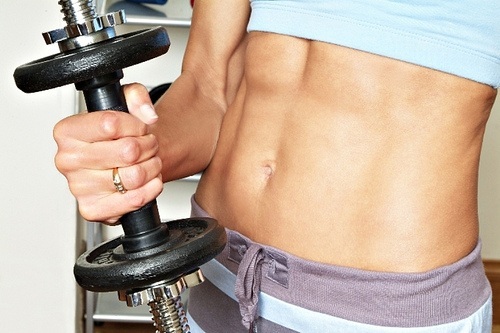 There are 11 Ab workouts that are performed in a mere eight minutes. Pretty nifty, huh? They’re your basic crunches, curls, reverse crunch, and a few others that I, personally, never heard of. They’re simple exercises that anyone can perform. Depending on your physical state, you will eventually begin seeing some lovely abs. It’s safe to say you should probably include other exercises to help you lose weight as well. A 30-minute cardio exercise (like running, swimming, rowing, cycling, etc) is a great “warm up” before doing your ab workout. Your system will be pumping blood and it’ll help burn more calories and fat. The 8-minute abs video can be found here.